A fiesta in bowl, Mexican Arroz con Camarones (Rice and Shrimp) combines Mexican flavors – cilantro, cumin, and garlic – with shrimp, rice, black beans, and veggies. Garnished with avocado, jalapeño, more cilantro, and lime wedges, it’s quick, healthy, and flavorful… A perfect one pot meal for any day of the week! Disclosure: By posting this recipe I am entering a recipe contest sponsored by the Seafood Nutrition Partnership and I am eligible to win prizes associated with the contest. I was not compensated for my time. Always an important consideration (in my mind) is whether or not my fish/shellfish is sustainable or not. While I love fresh and “wild caught,” for many of my readers, it’s not an option. There are some excellent sustainable choices widely available in the freezer section. I often mention my “go to” source for sustainable fisheries The Monterey Bay Seafood Watch. This Mexican Arroz con Camarones (Rice and Shrimp) obviously requires shrimp. The Seafood Watch offers “Best Choice,” “Good Alternatives,” and “Avoid” shrimp sources. It’s an excellent resource! You have purchased the frozen shrimp. Now what? The best way to thaw your shrimp is overnight in the refrigerator. If time does not allow, place the shrimp in a colander and run a trickle of cold water over it. It should be ready in about 15 minutes. I have a process that I discovered in my early adventures cooking Persian food – using a blender to purée key herbs and aromatics to infuse flavor into a dish. I incorporated the cilantro purée in my Peruvian Chicken and Rice (Arroz Con Pollo), and the recipe is one of my most popular. I have a lot of prep bowls, and I use them! I have everything on the counter beside my range before I turn the burner on. While the rice simmers, I prep the garnishes. I like a heavy skillet or saucepan for this dish. Make sure it is large enough. I have a large cast iron skillet with a well-fitting lid (important!). The rice, cumin, and garlic get sautéed in a bit of olive oil. Add the bell pepper and corn. Cook another 1-2 minutes. Add the liquid and black beans. Cover. After about 10 minutes, add the prepared shrimp and replace the lid. Cook another 10 minutes (until rice is tender and liquid is absorbed). Stir to combine. Cover until ready to serve. 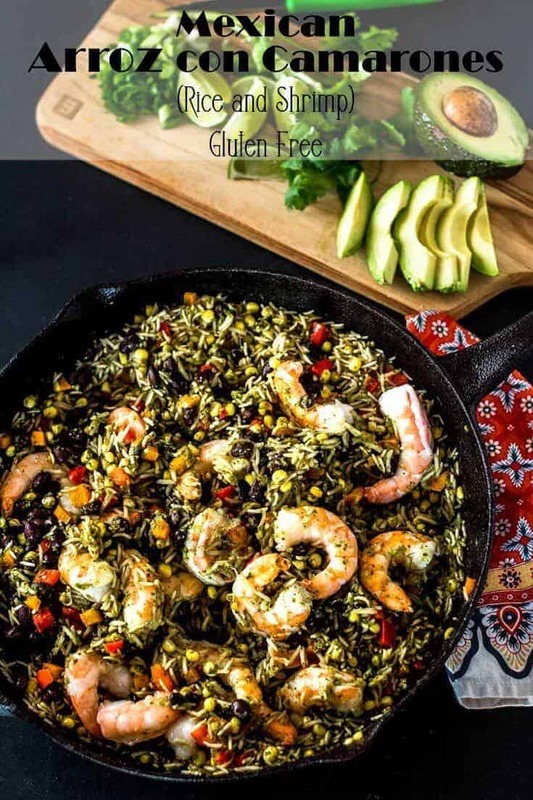 A fiesta in bowl, Mexican Arroz con Camarones combines Mexican flavors - cilantro, cumin, and garlic - with shrimp, rice, black beans, and veggies. Garnished with avocado, jalapeño, more cilantro, and lime wedges, it's quick, healthy, and flavorful... Ready in 30 minutes! 1 medium bell pepper, I like red and orange! 1 cup corn kernels, I like fresh off the cob, but frozen is fine too! Peel and de-vein the shrimp unless it's already done for you. Twist bunch of cilantro at the base of the leaves. Discard any large stems. Rinse well. Add to a blender. Add the onion chunks and 1/4 cup broth/stock. Puree until smooth. Pour into a measuring pitcher. Use a spatula to scrape down the sides. Add broth/stock to the 2 cup mark. Set aside. Chop the bell pepper, cut corn off the cob if using fresh, rinse and drain the black beans. Measure out the rice. Have the olive oil, garlic, and cumin ready to go. Add olive oil to a skillet or dutch oven over medium high heat. Add the rice, garlic, cumin, chopped bell pepper, and corn. Cook 1-2 minutes until fragrant. Add the prepared cilantro/onion/broth liquid to the pan along with the black beans and the salt. Cover. Reduce heat to a low simmer. After 10 minutes, add the shrimp. Stir. Replace cover. Cook another 10 minutes. Check a grain of rice. If it's not tender give it another minute or two. You can add a tablespoon of broth if it's dry. The shrimp should not be transparent. Just leaving the cover on the pan (with no heat) may be enough to finish them if they're not quite cooked. While the rice and shrimp cook, prepare any garnishes. Scoop into shallow bowls or plates, garnish, and enjoy! I use basmati rice with a 1:2 ratio with water. I do like to rinse it first. Regular long grain rice or even jasmine rice is fine too. Check your rice package for liquid requirement and cooking time. Make an adjustment if necessary. My shrimp (on photo day) were large (16-20 count), and needed the 10 minutes. If you're using smaller shrimp, you might want to add them 2-3 minutes later. Overcooked shrimp are so disappointing! Macronutrients (approximation from MyFitnessPal.com): 442 calories; 37 g protein; 69 g carbohydrates; 8 g fat. A great dish! I love making one pot meals with rice cooked in the dish. This one is like a Mexican version of jambalaya. Love it! It is like jambalaya MJ! That had not occurred to me... I did a Peruvian Chicken and Rice that used the same method. So much flavor!